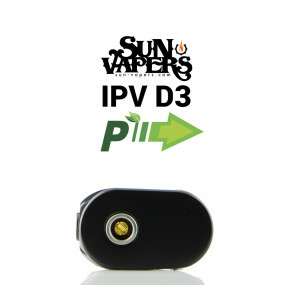 What’s New About the IPV D3? Before we dive in let’s go over the main differences between the previous IPV D2 and the new IPV D3. Perhaps the most significant upgrade would be the re-designed battery compartment allowing for more efficient use of batteries and longer battery-life in return. The new design includes a tight spring loaded negative post, and a slim, but solid positive post (located on the bottom). Also, there is no longer a right or wrong way to put the battery cover on, it may be placed on upside down without any noticeable difference. “Step Down” function is a new built-in feature which allows voltage step-down when using the device at low wattage. Whereas before, the device would tend to burn hotter than expected at lower wattage settings. The new chip adds the new step-down function, allows resistances down to .15 ohms while in power mode and 0.05 ohms while in joule mode. You’ll notice an increased thickness of paint and a heavier feel when you pickup the IPV D3. The LCD on the D3 is now a blue (hologram-look) display and will stay lit until 45 seconds of no activity whereas the D2 only took 5 seconds to turn off. The screen also seems to have some sort of tint/ polarized filter layered over the top, probably to help visuals while out in the sun. If you haven’t already had the chance to experience the IPV D2 in all of it’s glory, I would suggest picking one of the new IPV D3’s instead. I’ve ran this mod with a single Sony VTC4 18650 at 65 watts (0.5ohm) and have been getting about a 25% increase in battery performance compared to my D2. The IPV D3 is a very well-rounded mod and can accommodate any vaper looking to have a comfortable and trusted vape that is built to last. You’ll definitely want to have the IPV D3 in your collection.